After an incident that called for pepper spray, clean up is an important next step for both officers and their subjects. 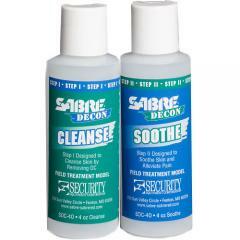 Sabre has created a dual step process with the Sabre Decon Cleans and Soothe 4.0 oz kit. The Cleanse Step I formula cleans skin and removes the chemical spray from the porous surface so it will no longer be absorbed nor spread to more skin. Next, proceed to the Soothe Step II formula, which provides moisture to affected areas and neutralizes the burn of the pepper spray. This handy kit will serve to decontaminate up to 6 people. A must have for those who work in the field where OC application may be neccesary.